Hollywood Regency glamour and glitz meets Palm Spring golf course chic. Situated on the 8th fairway of the North Course of Indian Canyons Golf Resort, this one of a kind 1963 midcentury modern ranch home was recently remodeled and designed by the local award winning design team of H3K. The lemon yellow entry doors lead you into a world of art, color, history, design and elegance. Floor to ceiling walls of glass and sliding doors blur the lines of indoor and outdoor living in the open floor plan. 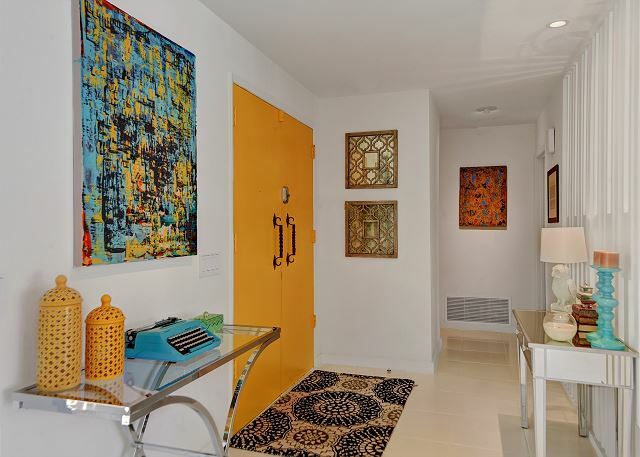 The bright pops of color, lacquered pieces, bold wall-coverings, mirrored chests and shiny tile floors all help to create the perfect Palm Springs experience for those lucky enough to stay here! 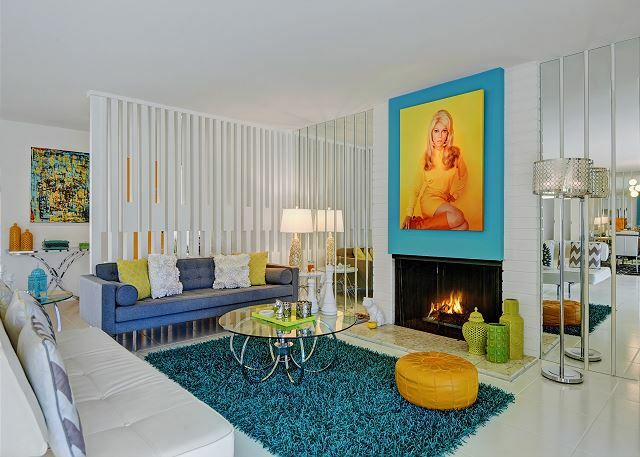 Perched above the living room fireplace, Nancy Sinatra invites you to enter a world of fun, sun, and old Hollywood. Whether you are sipping cocktails on the mod furniture, watching a movie on the 46” flat screen TV, or sipping coffee while looking out at the golf course – each moment will take you away and leave you with memories you’ll long to recreate again. The fully equipped kitchen with GE Profile stainless steel appliances, side by side refrigerator, microwave/convection oven, and wine cooler is stocked with everything you could need to prepare and serve your favorite gourmet meal. The master suite will pamper you with the CA King bed, high quality linens, geometric wallpaper, 46” flat screen TV, and black out shades. The master bath includes a double shower with custom glass and tile – with both rain and hand held shower heads, double vanity, high end fixtures and large walk in closet. The guest bedroom is equally as fabulous with a CA King bed, 30” flat screen, ceiling fan, and direct Western mountain views. This room has its own dedicated guest bathroom with a shower/tub combination and a door to the outside yard. There is also a second guest bathroom on the other end of the home with pool access. 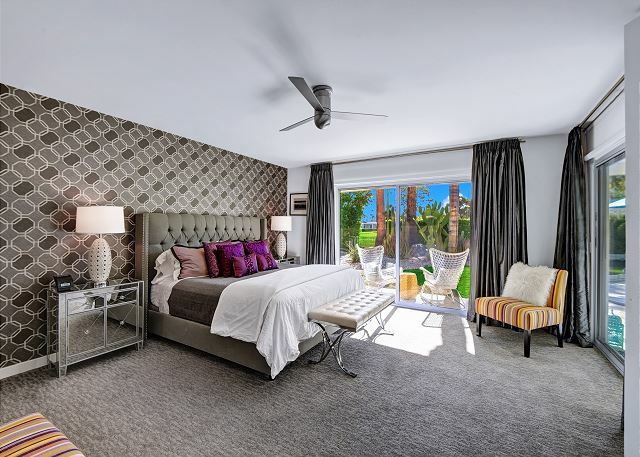 This home truly boasts every amenity and detail necessary to make your Palm Springs vacation memorable for years to come. The sparkling pool and spa, meticulously landscaped grounds, mature palm and citrus trees, and quiet South Palm Springs location add up to sun drenched perfection. Pack your bags and come experience it for yourself! THIS HOUSE REQUIRES BOTH A $1000 REFUNDABLE DEPOSIT AND THE PURCHASE OF ADDITIONAL DAMAGE INSURANCE FOR $79. IF YOU DON'T WANT TO PURCHASE THE DAMAGE INSURANCE YOU CAN INSTEAD OPT FOR A $4000 REFUNDABLE DEPOSIT. WE DO NOT SUGGEST BUYING DAMAGE INSURANCE THROUGH VRBO OR HOMEAWAY. BUYING DAMAGE INSURANCE THROUGH VRBO OR HOMEAWAY WILL NOT WAIVE YOUR SECURITY DEPOSIT AND MAY NOT MEET THE PROPERTY MANAGEMENT COMPANY'S COVERAGE REQUIREMENTS FOR THIS HOUSE. DECLINE THE INSURANCE THE OFFER YOU AND WE WILL ADD THE PROPER INSURANCE TO YOUR FOLIO AND BILL YOU FOR IT AFTER YOU BOOK. Clean home. Perfect for families with children. Really enjoyed it. We had a problem with the pool and Spa but management was on it and helped us out and they gave us the heating cost back. Great house, very relaxing and cool. One thing that was a little disturbing was that we had about 2 golf balls landing in the pool area per day,,, could be dangerous. They should put up a net. All in all we totally recommend it, great place!! A perfect Palm Springs gem! We loved our stay at this house. It was perfect for us and exactly as described and pictured. It’s so well done and so comfortable with the perfect pool for lounging and enjoying a cocktail. We have been coming to Palm Springs for years and this house definitely delivers on the quintessential PS experience. We loved our stay at Regency Modern! Amazing house that is decorated perfectly. The yard and pool are so fabulous. Staff were very helpful and attentive. In a super quiet neighborhood, but still close enough to enjoy the attractions. Great, relaxing vacay! The property backs onto the golf course and is very quiet. The house is exactly as pictured, well maintained and clean. Kitchen had everything we needed for our stay. The pool and outdoor space is very nice, lots of sun but seating areas in the shade when you want to cool off. The management company was easy to work with and were responsive to our queries. 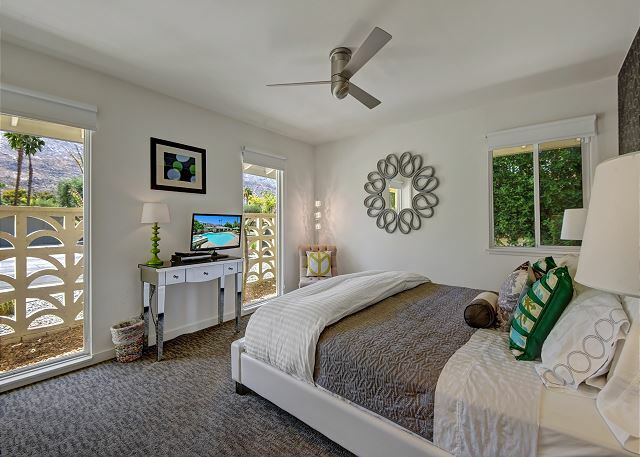 We've rented a number of properties in Palm Springs over the years, this certainly ranks as one of the better ones. The Regency did NOT disappoint! THe property was fantastic - very spacious, well equipped and the backyard was an oasis! The neighbourhood was quiet and with the north course still being closed for the season - we had complete serenity. The only negatives - we could only stay a week and the hyper sensitivity regarding noise by the city and its residents. Both are nothing Altamira can control!! "Wow" was the first words that came out of our mouths as we entered the home. It was beautifully decorated while at the same time functional. It was super clean, bright and very inviting. The pool was beautiful and private. We enjoyed the spacious master bedroom and the modern shower. We were also very close to restaurants, shopping and the movie theater. We didn't want to leave the house, though! Although we choose different vacation rentals every year during our trip to Palm Springs, we for sure want to return next year to this same spot! Perfect house and location. I would only add that they could have had a blender and bicycles. Other than that, the pool was perfect and the house very comfortable, clean and cool decor! We enjoyed a long 3 day weekend...hiking was within walking distance, great neighborhood & a nice grocery store (Jensen's) just a couple of miles away. The backyard faces East which makes for a nice sunrise from the Master Bedroom & while having coffee in the morning. We highly recommend the Regency Modern & we will definitely return. We have spent only 3 nights in this house and yet we felt like it was a week. This house is a gem. The location is perfect. The decoration beautiful. The house is so confortable and enjoyable. The cleaning was perfect and the service impeccable. The views on the mountains are also great. Would come back for sure. Great stay! We would highly recommend this property. We visit Palm Springs frequently and would definitely stay here again. House was exactly as described. Clean, cute, plenty of kitchen necessities as well as bath and pool linens. Pool was heated perfectly, nice neighborhood to take a evening walk around. Looking forward to renting it again. Exactly as it looks in the photos, and extremely clean. While it was slightly over decorated for me, I felt very much at home and very comfortable. The pool area is terrific - spacious, beautifully maintained, and extremely quiet and relaxing. The sunsets from the backyard are beautiful (the house is on golf course). I love the Indian Canyons neighborhood, and this house is in a perfect location. It is a nice 15 or 20 minute walk to the Smoke Tree Mall, which has a grocery store, nail salon, burger restaurant, etc - a 5 minute drive. I am runner, and loved running outside and taking a walk in this neighborhood - beautiful mid century homes (the famous Pink Door house is in the neighborhood). They were absolutely great. Completely responsive and reliable. It was an absolute pleasure doing business with them. I would highly recommend renting this house. Love, Love, LOVE this house!! We felt fully transported to total relaxation in this luxe Mid-Century stunner. From the stylish furnishings and finishes, to the enormous Master suite, to the well-equipped oasis of a backyard with pool and spa, this home ticks all the boxes in what one looks for in a vacation home. Fully updated kitchen and 2 car garage help round out this compound. Conveniently located near great restaurants and grocery stores for all of your needs. Will definitely be booking this gem again. Beautiful, private home - perfect stay! This is the second time we have stayed at this property and it is fantastic. The first time we stayed was with friends and the second time was with our young daughters. It has an awesome private backyard with pool/spa and has the right combination of sun and shade. The home is decorated beautifully and is very clean. It is in a nice, quiet neighborhood and is very close to amenities such as grocery stores, coffee shops, etc. We will be back yet again! Great house, quiet neighborhood. The home is clean, stylish, well-maintained, and relaxing. Our family greatly enjoyed our experience there and would certainly stay again!